One of RuneScape's most cherished quest series comes to a close in this wild ride with the elves and humans of Ardougne. Lord Iorweth, head of the Iorweth elf clan, has a new plan to summon the Dark Lord, a being with the power to re-grow the elf city of Prifddinas as an Iorweth-only city. Help Arianwyn put a stop to this plot by gathering the elders of Prifddinas and re-growing the city before Iorwerth can. Speak to Arianwyn in Lletya. To begin, speak to Arianwyn in east Lletya. He will tell you that the dwarves have cleared the path to Prifddinas! Congratulations, Quest Complete! 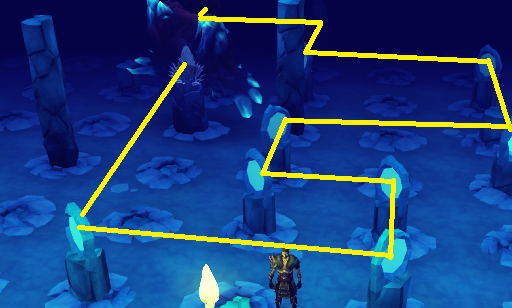 Nevermind, it appears Arianwyn still needs your help to investigate further into the Prifddinas underground. Accept the quest and grab a mourner outfit (if you don't already have one, you can get one from killing a mourner at Arandar pass) and Arianwyn will teleport you straight to the Corridor of Light. Note: If at any time you die in this quest your gravestone will appear next to Arianwyn in Lletya. Now in the Prifddinas underground, you can speak to the Dwarf for a report which discusses the state of the Elven City. Now, Head to through the elvish looking door to the west and then the door to the north. You will be stopped by the Deathguard Captain, who is pretty much your stereotypical boss (get used to it if you haven't already). She will ask what you were doing in the storeroom. Tell her you saw a mouse and thought it might get into the food stores. When she asks why you didn't tell her, say you thought she looked busy. She will let you off the hook and tell you to relieve the guards in the next room with the archaeologist. Go to the westernmost area and speak to one of the mourners to relieve them. Now ask Iestin Edern (the archaeologist) what he's doing. Go through the options and then tell him to hurry. He tells you he needs a report of what is actually going on before he can finish his project. He tells you to go find a plan of what Iowerth is doing and gives you a report that details his work. 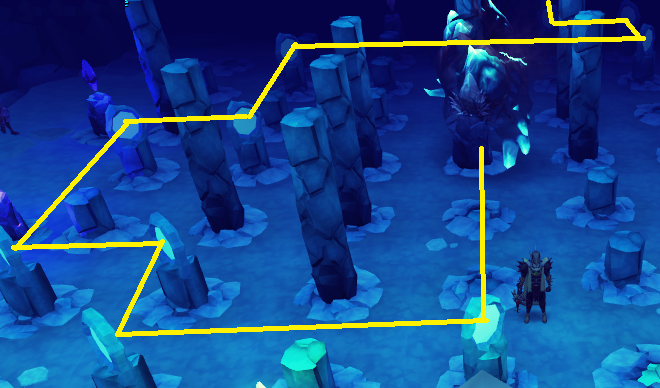 Climb up the stairs to the north and you will wind up in Prifddinas. After getting over the disappointing fact that Prifddinas looks like a third world country, head north and speak to the Mayor of Prifddinas. She will refuse to give Iestin a master plan of the project and take Iestin's report, but will ask you to check up on the gnomish cuisine she ordered. Head south and speak to the Mourner guarding the gnomish cuisine. Tell him that the mayor wants the food to be distributed to the crowd. Now run back up to the Mayor's office and tell her that the guards are distributing food to the crowd. She will run off to stop them, at which point you can grab a Iowerth Master plan . Head back to Iestin and give him the report. He will reveal the plans: the genocide of the people of West Ardougne! Ask him what you can do to stop it, and then Arianwyn will step in to the conversation. Lodestone teleport to Ardougne and walk south of the church and speak to Councillor Halgrive. Tell him about the document and he will obviously appear shocked. He will tell you that he will begin supporting a rebel army and will give you a proclamation which you can show to King Lathas' men in case of emergency. Now head through the gates to the west to enter West Ardougne. Enter the building in the center of Ardougne and climb up the stairs and speak to Bravek. Again, tell him about the news. He will appear saddened and yet not too shocked. Tell him you need to overthrow the Mourners and he will give you a list of names of people that could help in a revolution. Talk to them. You will need to take off at least one piece of Mourner gear to do this. Elena - Elena is the girl you rescued in Plague City and also the person who discovered the Plague was a hoax. You can find her just west of the log balance on the river of East Ardougne. She is the only revolutionary outside of West Ardougne. Koftik - Koftik is the man who lead you through the Underground Pass and eventually went insane until you defeated Iban. Speak to him just outside the Underground Pass. Koftik can also be found deep in the Underground Pass. Do not talk to him here, as you will get no chat options for the rebellion. Ted and Martha Rehinson - These two are the people that Elena stayed with before she went missing in Plague City. They can be found just north of Bravek's building. Nurse Sarah -The nurse of West Ardougne. She can be found in the southwestern most building of West Ardougne. Jethik - A man who helped you find Elena in Plague City. He can be found in the West Ardougne square. Carla - A woman dressed in purple who had a son die to the "plague." She can be found west of the West Ardougne town square. All of the revolutionaries will appear in the Ardougne Church. Explain exactly what is happening to them and tell them it's time to strike. They will head to the Mourner HQ in West Ardougne. Head to the Mourner HQ in northeast West Ardougne yourself and kick down the door. Kill all of the Mourners on the ground level and then head below. Continue killing all of the Mourners here and then open the door and kill the head mourner. He puts up a better fight than the others, but he is still easy picking. You can safespot him behind a table. Once on his last leg, interrogate him. He will tell you only the higher-ups (such as Lathas) truly know who the Dark Lord is. Kill him or spare him. Following this, Elena will appear and give you a flag to hang on the Mourner HQ. Head back outside the underground area and climb to the top floor of the Mourner HQ. Replace the standard. You will immediately gain the attention of a paladin and a knight, Sir Hugo and Sir Edmond. You will show them your proclamation and they will run back to Ardougne Castle. Grab some combat equipment and follow them to the Castle. Speak to Sir Edmond outside. He will tell you that you will need to defeat a few paladins to get to his throne room. If you are ready, tell him so and begin the coup. Run through the combat and head upstairs to King Lathas' throne. Confront the King and he will get Sir Hugo to fight for him. 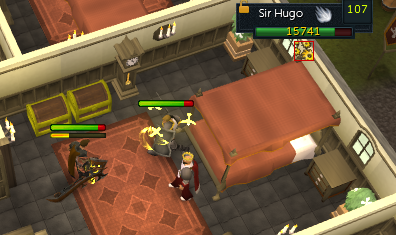 Hugo is slightly stronger than the head mourner, but should still be an easy fight. If necessary, you can safespot him. Once he is done, interrogate Lathas. Following this, you can either kill or exile him. Sir Edmond will appear and tell you to head back to the Elves. 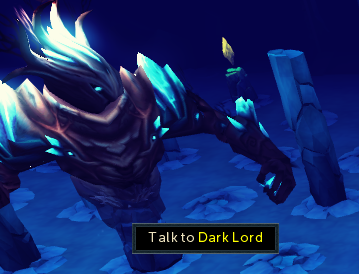 Teleport to Lletya and then speak to Arianwyn, who will teleport you back to the Prifddinas underground. Speak to Iestin again and ask him what needs to be done. He will tell you that you have to find the eight leaders of the Elven Clans to regrow the city. Only six more need to be found; Iowerth's location is known (and he's not helping out) and Arianwyn reveals himself to be the lord of the Cadarn clan. Arianwyn will teleport you back to Lletya where you should speak to Gwir the scribe. Pick up the The Lost Elders book on the bookshelf in the room, read it, and then speak to Gwir again. Go through all of the chat options. Now it's time to find the elders! Trahaearn is located in the Underground Pass. Bring combat equipment and a rune bar. Enter via the Elf Lands entrance and mine the tunnel south of the Well of Voyage. Upon entering the tunnel you will face three level 70 elven automations. Once you have dispatched them, try to wake Trahaearn and then repair her using your rune bar. Now, send her on her way to Prifddinas. To find Crwys, chop down any tree in Tirannwn. You should see a beam of light towards his area. You eventually will come across a diseased tree in the middle of some dense forest. Use your plant cure on it and send him to Prifddinas. As Ithell was the one who created Lletya, she also decided to leave her mark on the town. There are five symbols around town, each of which you should inspect. One is in the bank, another in the ranging shop, one in Goreu's building, another upstairs in the clothing store, and the last one on the outside wall of the church (directly above Arianwyn). 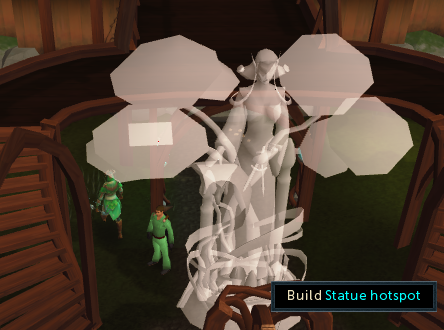 Once you have found all five symbols, a statue hotspot will appear in Lletya. Using 10 Magic logs, build the statue. Speak to Kelyn (who becomes Lady Ithell) on the balcony and send her to Prifddinas. Amlodd is also in the Underground Pass. Bring the amlodd charm, one gold charm, one green charm, one crimson charm, one blue charm, 200 spirit shards, and an empty summoning pouch. Create an Amlodd pouch using the obilesk and then summon Amlodd. Tell him to go to Prifddinas. You can summon Amlodd with a familiar already summoned. Lady Helfin is located near the Poison Waste. You will have to traverse the poison waste to get to her. Run outside Lletya and then run south. Jump on stepping stones and continue west. Use the map below (follow the yellow brick line) to avoid hitting dead ends. What does a crystal's hardness represent? Seren's faithfulness to the elves. What represents Seren's harmonious nature? Once done, tell her you are rounding up the elven clan leaders and she will leave for Prifddinas. Lady Meiylr is the only elder not located in Tirannwn. She has fled to "the dungeon of the kin," which is Daemonheim (Daemonheim was originally a Dragonkin fortress). Before heading there, you must create her potion. Grab a vial of water and cadantine OR take three doses of a super defence potion. Teleport to the Tirannwn lodestone and take whiteberries to the north (if you don't have a super defence potion; you will have to pass a trap), pick blue mushrooms around the lodestone, and then pick red mushrooms to the west of the lodestone. Grind the mushrooms, create the super defence potion if you don't have one already, and then place the mushrooms in the super defence potion. You will create a Meilyr potion . Teleport to Daemonheim using a Ring of Kinship and drink the potion in the Daemonheim lobby. A portal will appear. Enter and speak to Meiylr. She will leave for Priffdinas. Once you have met all of the elders, talk to Arianwyn again and he will teleport you to the underground. Speak with Iestin who says that you need a diversion so the city can be regrown without interruption. Either walk to or take a charter to Tyras Camp and speak with General Hining. Convince him to attack the Iowerth Elves. Now teleport back to the underground and speak with Arianwyn. Now head through the door to the west and you will be in the Grand Library. Now, you will have to solve a light puzzle (saving the best for last!). To accomplish this, you will need to place light from the seals of each Elven clan into the seal of Seren in the center of the Library. To angle the beams into the seal, you will need mirrors. You have an unlimited supply of mirrors at your disposal and you can rotate the mirrors. 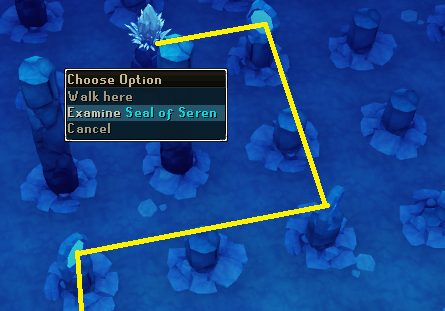 Place a mirror two plinths (including the low plinth) west of the Cadarn seal, a second two squares north of this plinth, and a third two squares west of this plinth. Angle the mirrors as seen in the picture below. Once you have completed this, two shadows will appear out of the ground. They are level 98 yet easy to kill with only 1000 lifepoints. To complete the puzzle, place a mirror two squares north of the Trahaearn Seal, a second directly east of this mirror, a third mirror four plinths to the north of this mirror, and the last mirror two plinths west of the third mirror. This time, a greater shadow will appear. It will attack with a strong magic attack, so try to get into melee range. Kill the other shadows when you have killed it. For this puzzle, place a mirror on the plinth directly north of the seal, and then a second mirror on the plinth to the west of the seal. Now, head north and place a mirror on the plinth on the northern most row adjacent to the second mirror. Place a mirror four plinths east of the this mirror, another one plinth south of this mirror, and then another two plinths west of the second to last mirror. Once you have completed this seal, the Dark Lord will appear! The Dark Lord is level 107 and you must defeat him to complete the puzzle. He is not terribly difficult to fight, but not a pushover either. He will frequently summon dark portals which consistently hit for 10% of your maximum lifepoints. Before summoning the dark portals, a white circle starts to form around the square where your character is standing. Simply move two squares in either direction to avoid this. He will also summon several other shadows. Pray protect from magic and attack the dark lord. Using a range or magic based attack may be wise as it will aid in attacking and avoiding the dark portals. You must constantly attack him; if at any time you stop attacking him for a certain amount of time he will regenerate his life points. Because of this, it would be wise to use a damage over time ability (such as fragmentation shot or combust) so you can continue taking hits. Dreadnips can be useful here as well. Once he is dead, kill the other shadows. Now, onto the puzzle. Place a mirror to the plinth east of the seal of Ithell. Place another mirror two plinths north of this first mirror and place the third mirror two plinths east of this mirror. Place the fourth mirror two plinths north of the third mirror and the fifth mirror two plinths east of the fourth mirror. Place the sixth mirror two plinths south of the fifth mirror. Activate the three mirrors to the north and east of the sixth mirror and then have the light coming from the ninth mirror be directed into the tenth mirror, which is directly east of the seal of Seren. From here on, you will have to fight the Dark Lord after every seal. You are allowed to bank. His fight mechanics do not change, although you will have to deal with more shadows and slightly increased strength each time. Remember, if you die your grave will appear next to Arianwyn in Lletya. For the Amlodd Seal, place a mirror on the plinth directly east of the seal. Place a second mirror directly north of this seal and then a third mirror directly east of this mirror. Now, place a fourth mirror four plinths south of the fourth mirror. Place a fifth mirror two plinths east of the fourth mirror. We won't get into every single mirror from here for the sake of time. Just work around the four pillars nearby until you get to the mirror directly east of Seren's seal (where the Dark Lord is). From here, rotate this mirror so the light enters Seren's seal. For this next seal, two mirrors will be locked in place and you will be unable to rotate them. Due to this, you will have to use every single mirror. The path the light takes is so large that you cannot see it in one screen. However, the path the light takes is very simple. 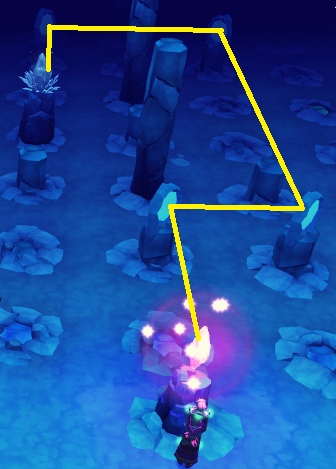 The light travels in a clockwise manner, and every rotation it gets closer to Seren's seal. Simply rotate the northeastern most mirror to begin. The Dark Lord will now realize that he's not doing too well in the battle of good or evil. To help, he summons Lord Iowerth, who he promptly kills, gaining more power. Despite his alleged increase in power, he does not gain any fight mechanics. For this seal, set up a mirror directly southeast of the seal (the mirror directly south is locked). Set up a third mirror directly south of the second mirror you just placed, but angle it so that any light that hit it goes toward the west. Set up a fourth mirror four plinths west of the third, and then set up a fifth mirror to the plinth south of the fourth mirror. Set up a sixth mirror two squares to the west of this mirror. From here on, work around the pillars and locked mirrors until you reach your destination. After the Dark Lord reveals himself to be the corrupt part of Seren which has long been cast out, continue on with the puzzle. This is the hardest puzzle, as you might expect. Many mirrors are locked. You should start out by arranging the light to go north and then south. This will take the light towards the west, and then north again. The light will enter Seren's seal through the North. After you have completed the last seal and defeated the Dark Lord, the Elder Elves will be joyful. They say that they will begin to regrow the city, and once it has been regrown it will be open to all races, not just elves. Arianwyn will give you 15 items as a reward and offer a deposit box so you can make inventory space. Congratulations, you have completed the Plague City storyline! Plague's End is part of the Plague City Storyline, which is one of the longest running storylines in Runescape. It starts with rescuing a young woman from West Ardougne and ends with building a giant elf city made of crystal. Well, things escalated quite a bit, did they not? The first quest in the series, Plague City, was released on August 27, 2002. 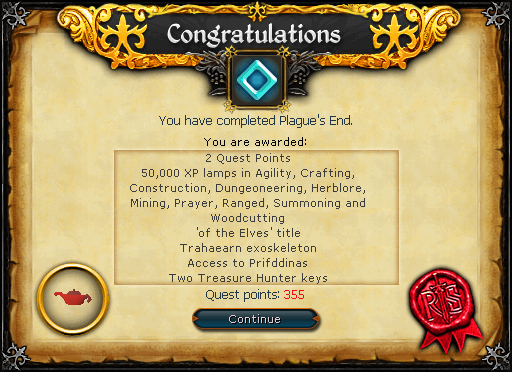 The final episode in the series, Plague's End (this quest) was released on August 11, 2014, meaning this series was 16 days short of turning 12 years old. A full list of all of the quests involved is listed below, while the key entries in the series are starred.